This past summer ended with a late heat wave that had temperatures in Southern California soaring well past 105° for a week straight. Foolish me, thinking the extreme heat of summer was over, right? Coming home to a stifling house reminded me why having an adaptive cooling solution can be so critical, since sweating in the living room waiting for the cold air to kick in was miserable. The new Emerson Sensi Touch Wi-Fi smart thermostat made its way to my desk a few days later, and I put it to the test to see if it could offer a practical solution that stands out from the pack. There are a handful of smart thermostats on the market, and the space is getting a bit crowded. A lot of the smart thermostat companies cropping up are startups, and only a few are from actual HVAC companies with a history in the game. Emerson is one of those, with over 75 years in the thermostat world, which is why their previous Sensi Wi-Fi thermostat was so well-regarded in the home automation community. While the term “smart” pretty much means “app” these days for a slew of gadgets (many of which don’t realistically need them), there’s actually a lot more utility to a smart thermostat than just having a fancy app. In fact, considering that HVAC costs are the leading factor in residential energy consumption, automating the home thermostat is the most impactful smart upgrade that a home can have on saving some serious cash. 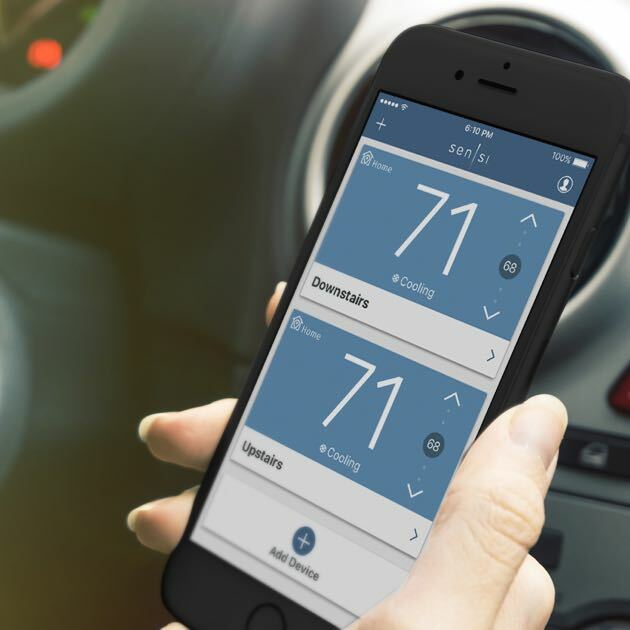 Smart thermostats use app integration which allows temperatures to be set from outside the home, intelligent and adaptive scheduling, and some even have geofencing to engage a temperature setting when the phone reaches a certain range from the home. This all equates to a far more efficient cooling and heating system, which makes it an easy starting point for those looking to make a quick and easy “smart” home upgrade. Actually, the Sensi Touch has a pretty broad list of integration partners; in addition to Amazon Alexa and Google Home the Touch can also integrate with Apple HomeKit, Wink (which can connect various smart devices), and Google Assistant. These integrations essentially deliver access to a variety of control methods, and enable more complex incorporation in the Smart Home. This enables the thermostat to automatically start the heating/cooling process when a smart phone is detected within a certain range, which allows for greater comfort upon arriving home without wasting electricity on an empty home. This is more dynamic than a traditional schedule, and helps to account for variations in activity. At the end of the day, what this comes down to is ensuring that a comfortable home is waiting for you, but not wasting electricity the whole day through. This is actually one of my favorite aspects of home automation. The idea of coming home and things automatically springing to life upon your arrival is exciting, and an awesome look at the future of intelligent home integration. When you use apps like Stringify, and get deep into the IFTTT (If This Then That) implementation of home automation you can have a series of events all become triggered by an action. For those that are really interested in getting the most out of their smart home, this is the way to go. This is pretty straightforward, and while you can’t really dehumidify with the thermostat itself it is an interesting data point to have. In addition to indoor humidity, the Sensi Touch also has real-time outdoor temperature, which is a nice touch. This is ideal for keeping a constant comfort level in two-story or larger homes without having to set the temperature individually. Often times the upper story gets much warmer than the lower one, and depending on the location a single-thermostat might not offer the proper comfort control. 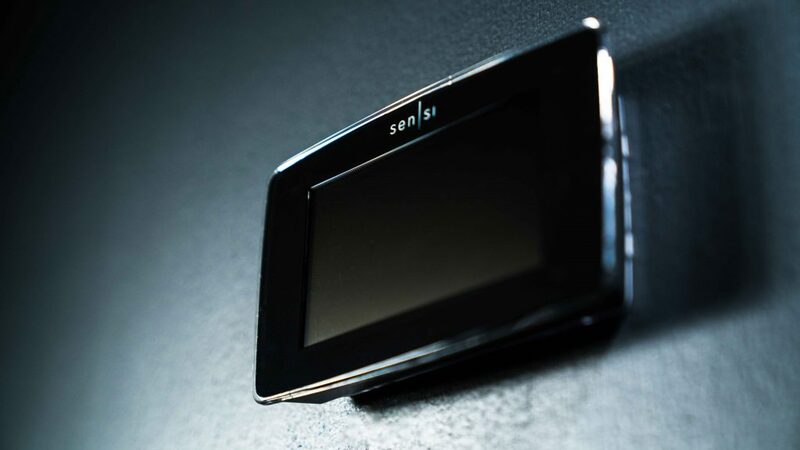 The Sensi Touch monitors drastic changes in temperature or humidity, and sends push alerts to notify users in the event of rapid changes in either. Generally speaking internal temperatures should not fluctuate dramatically over a short period of time, so this is a good early warning sign of other potential issues. Out of the box, the Sensi Touch looks super clean, forgoing any physical buttons opting for a strictly touchscreen approach. From the aesthetic perspective, the newer Touch model takes a big jump up over its predecessor with a far more modern look. The Touch is compatible with a fairly wide range of HVAC systems, which makes it useful for those that have gas, electric, oil, up to two stage heating and cooling (2H/2C), a heat pump with up to four stages of heating and two stages of cooling, heat only and cool only, or even geothermal and dual fuel. 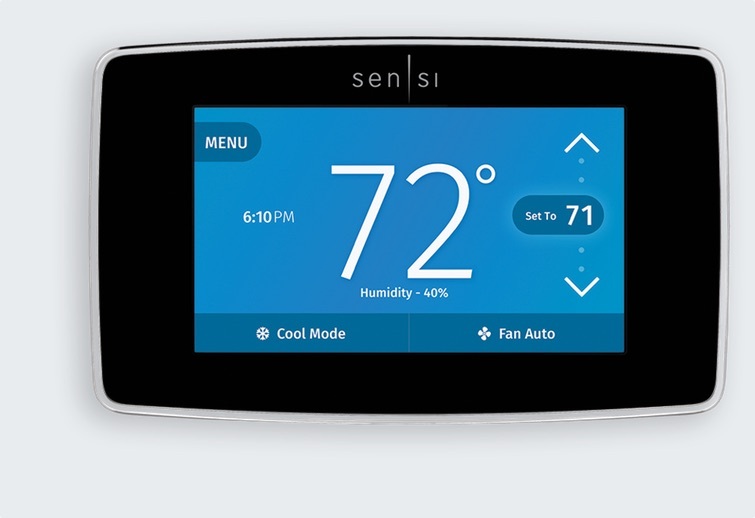 The Sensi Touch does require a “c wire” (common wire), which is a wire from the furnace to the thermostat to power all the modern features of thermostats. Even if you have never had a smart thermostat before, you might have one of these wires already in use to power the clock and basic scheduling functions on your existing system. Emerson states that their installation takes as little as 15 minutes, which I found to be true with the assistance of their Sensi app. 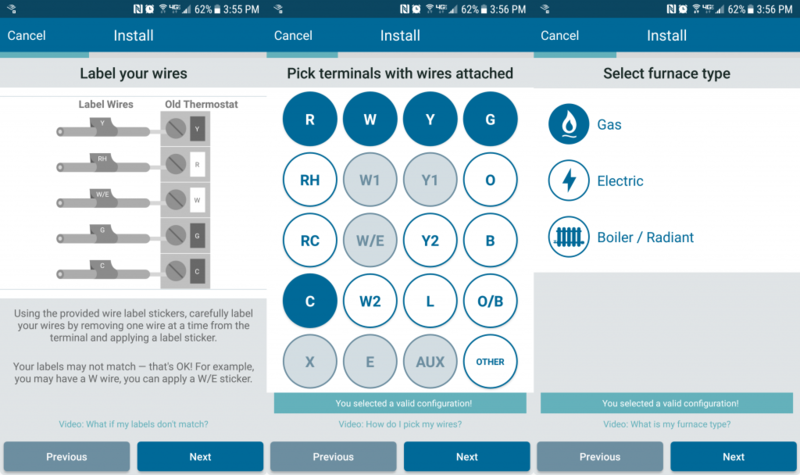 The intuitive step-by-step nature of the setup in the app makes it quite simple, even for those who have never installed a thermostat before. The process walks users through taking a picture of the previous setup before removal (always a good installation practice), and selecting in the app which wires are in use on the “dumb” thermostat. The app then maps the wires in use to the proper terminals on the Sensi Touch, removing all room for error. Each step of the way through the physical installation, the app confirms if you have a correct selection made or not, which ensures everything goes smoothly. All in all, this is one of the best app-aided-setups for a home automation product that I have seen. Once the Wi-Fi thermostat is up and running, setting up a schedule and preferences is super intuitive from the app, and navigating the unit itself is also popular. Users have the ability to customize the home screen content with a few different options, but it is relatively straightforward. Some of the advanced setting available include an A/C protection mode, which delays the cooling for a few minutes when the setting is turned off and back on in a short amount of time, to help save the equipment from being damaged. There are other options to lock out any activity outside of the app, and to customize the specifics of the furnace cycling on and off. The Sensi Touch is another solid Wi-Fi thermostat from Emerson, and one that offers a variety of integrations to choose from. 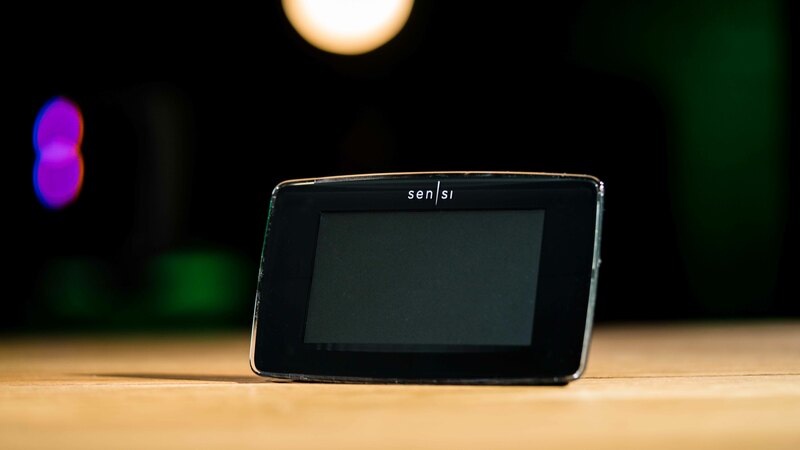 The sleek design and bright screen with an attractive interface are a more modern update from the previous Sensi model we took a looked at, which was more of a utilitarian version. The geofencing feature is handy, and the advanced scheduling options make for a dynamic product that fits smoothly into daily life. With the numerous integrations, connecting the Sensi Touch to the Smart Home ecosystem is not only intuitive, but also practical. At the end of the day, a practical solution that saves money and energy and offers more comfort is a sound investment in my book. Next PostDJI Inspire 2: The Best Professional Drone?